Feels so good to return on Fenrys. Bittersweetnes of missing the Las Vegas Open, but happy with the results of driving towards that schedule. Ultimately undone by the failure of my outsourcing adventure on the Drop Pods. I am enjoying this project more than any other in my quarter of a century in the hobby. I have so little time for the hobby these days, that every half an hour is a small treat, and my relative quickness is definitely an asset. The Rout is getting to a point where it really feels like a legitimate threat. 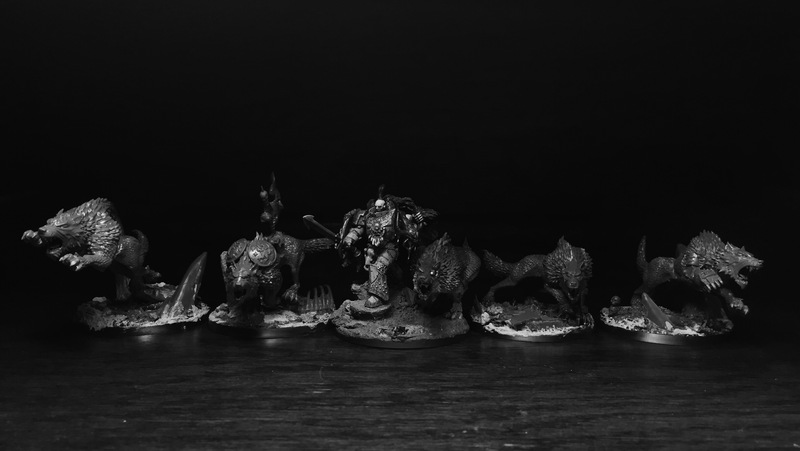 A Warband capable of ripping an army to pieces. After the wolves, it’s time to add Vehicles and really turn the visual into a fully fledged Warhammer 40000 Army. I’ve finished the final two “Void Claws” to finish off the special formation. Vosla’s pack is complete. I’m enjoying the breath of characters and different patterns of armor within the project. 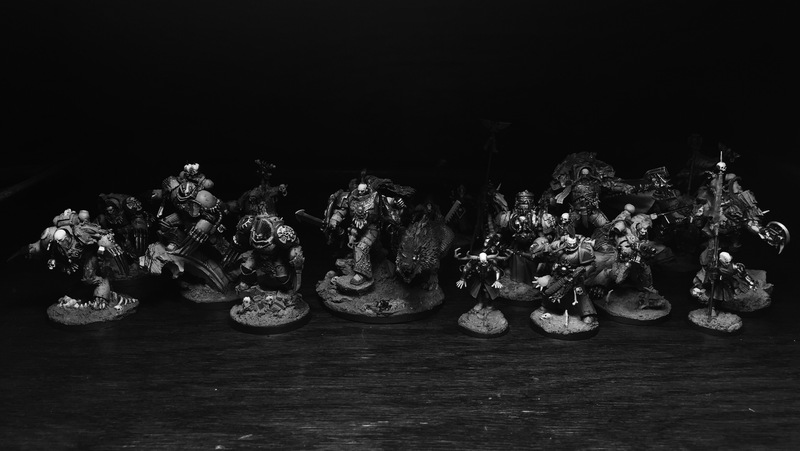 Now with two full “count as” terminator golf guard squads, and their friends, I feel like I can slow down even further and go create crazy individuals after the wolves and vehicles. I’m also very close to getting into gaming. The Thunder Wolves from the beginning were going to be a central part of this project and its imagery. They were never going to get riders like we’ve discussed, instead the Jarl runs and hunts with his pack. Still I wanted storm shields, power fists and other equipment worked in elegantly. I also wanted to create gothic, jagged, cold scenery for them to hunt on. For my wolf fangs! This is awesome, Russ be prided! The only think is that I believe that they look too down, maybe they’re enemy is smaller but I think that Void Claws will issue bigger foes, well it’s only an opinion maybe ther’s a background on it! Thanks 🙂 Cannot wait for FW to actually do Russ and the wolves! Just imagine adding the real deal to all of this. This is looking really great – one of my favorite projects to follow lately. I know what you mean about having little time for the hobby. My wife and I just had our 2nd child, and between baby and writing, I have almost no time to start back into modelling and painting. I’m thinking about starting a new blog to bring together all of my creative inspirations, and see if that can jumpstart some new projects for both writing and hobby – see how all of the things that interest me from a creative and artistic standpoint can feed off of each other to create something new. Anyway, it’s good that you can still find the time to work on projects like this. I doubt that the armor would allow for it, but when you were writing about the Jarl hunting on foot with his pack, it put me in mind that it would be interesting to see a marine that has gone so far to the edge of feral that he behaves more like a wolf than a marine. Sharp-fingered power claws digging into the rocky ground as he runs on all fours more than he walks upright. Snarling, raising his head to sniff the air during a hunt to track his enemies. Not that he thinks he’s a wolf in a comical sense, but that he’s wild and savage, animalistic almost to the point of being uncontrollable. It could be cool, but really hard to make the armor move or position itself like that. Definitely working on something exactly like you (and many snippets of fluff) describe. A fully “gone” wolfen. So far a few tries and no cigar, but think I have a lead and a recipe that might work now. So much cool stuff to do and so little time. Absolutely fantastic! Nothing more to add…. I don’t know what’s more impressive, the miniatures themselves or the speed by which you produce them. Forgoing the riders on the thunderwolves was a good idea, the original miniatures feel like some sort of Dino-Riders™, very toy-like. I visit this blog multiple times every day as well as subscribe to it. Sometimes I check in to see what new ideas or progress you’ve posted. Sometimes it’s just to admire the truly unique way that you have combined the scattered and often contradictory lore of the Vlyka Fenryka from the earliest Rouge Trader years all the way up to the slowly unfolding Horus Heresy and its seeming contradictions and secrecy. The way that you build a model and give it life and a purpose within the pack is inspired. I love the way that each and every model has a story and a purpose both in its build and paint and its precise place in this noble pack. I could go on for days fawning over each piece of wargear and the story they all tell. Instead, I would like to pay a special compliment to the color pallet you have chosen for this entire army. 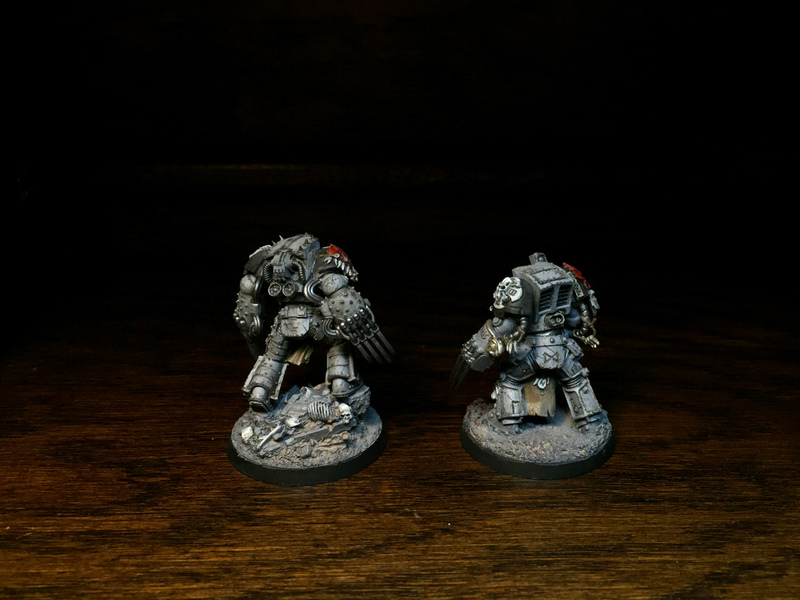 The different grays on different areas of the models really brings them to life. The subtle battle damage and brilliant individual heraldry on each Son of Russ really reinforces the feel of a Pack operating on the knife’s edge of loyalty to each other and disrtust or outright hostility to anyone not of their pack. That’s how I see and think about your work on these Wolves Migsula, I hope that you take it as the highest compliment that it’s meant to be and continue to delight, amaze and inspire myself with your work. I visit this blog multiple times every day as well as subscribe to it. Sometimes I check in to see what new ideas or progress you’ve posted. Sometimes it’s just to admire the truly unique way that you have combined the scattered and often contradictory lore of the Vlyka Fenryka from the earliest Rouge Trader years all the way up to the slowly unfolding Horus Heresy and its seeming contradictions and secrecy. The way that you build a model and give it life and a purpose within the pack is inspired. I love the way that each and every model has a story and a purpose both in its build and paint and its precise place in this noble pack. I could go on for days fawning over each piece of wargear and the story they all tell. Instead, I would like to pay a special compliment to the color pallet you have chosen for this entire army. 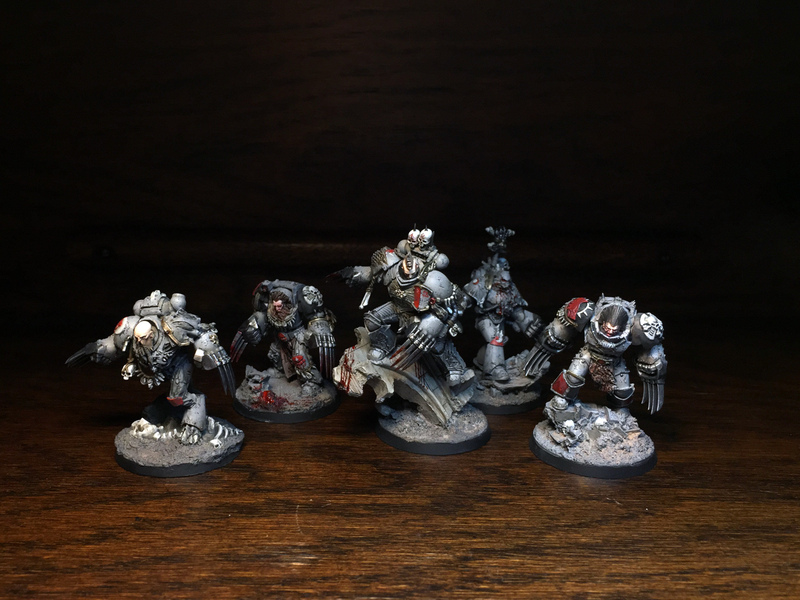 The different grays on different areas of the models really brings them to life. The subtle battle damage and brilliant individual heraldry on each Son of Russ really reinforces the feel of a Pack operating on the knife’s edge of loyalty to each other and disrtust or outright hostility to anyone not of their pack. That’s how I see and think about your work on these Wolves Migsula, I hope that you take it as the highest compliment that it’s meant to be and continue to delight, amaze and inspire myself with your work. Sorry if that seemed a little long winded, I Mainly wanted to compliment your work exactly as it affects me and my hobby. The Fenryka look pretty darn impressive together like that. This is a trule spectacular army in the making. I’m always amazed at how much passion you have for creating and modeling. It’s very inspiring. I can’t wait to see what’s coming next! Hello stranger! So very happy to hear from you and about your comments. They are also my own favorite works. Years of professional growth is hand in hand with the hobby and returning to my childhood subject matter has been a powerful bonus. Next Post Invitational – Now In Colour!